White House announces meeting between President Trump and Prime Minister Netanyahu will take place February 15. The White House announced Monday that Prime Minister Binyamin Netanyahu will meet with US President Donald Trump on February 15. White House Press Secretary Sean Spicer announced the meeting during a press briefing Monday afternoon. "Our relationship with the only democracy in the Middle East is crucial to the security of both our nations, and the president looks forward to discussing continued strategic, technological, military and intelligence cooperation with the prime minister," Spicer told reporters. The Prime Minister accepted the invitation to meet with Trump at the White House. 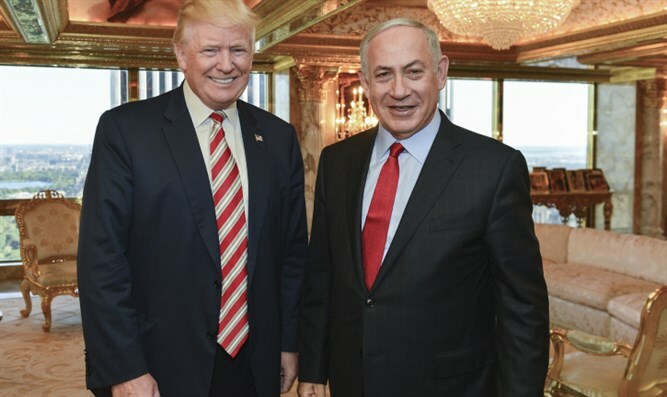 "I deeply appreciate President Trump's kind invitation to come to Washington and the warm words about Israel. I look forward to discussing with him the areas of cooperation between us that are so vital to the security and well-being of our two countries." Netanyahu said. Netanyahu said Monday that the Iranian nuclear threat would be high on the agenda during his meeting with President Trump, following reports that Iran test-fired a medium range ballistic missile in violation of a UN Security Council resolution.